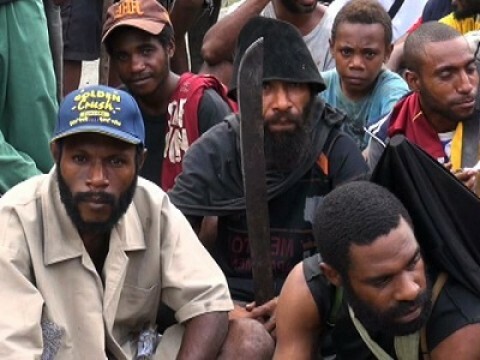 THE Hela provincial executive council has declared the Tari-Pori electorate and parts of Komo-Margarima a fighting zone, the National newspaper reports. It gives security forces in the province the green light to direct special operations into the tribal fight areas. While the council was meeting to discuss this agenda yesterday afternoon, vehicles were rushing to Tari hospital carrying victims of the latest shootings on the outskirts of Tari town. Hela law and order committee chairman James Pokaje confirmed that a child, a young woman and a man were gunned down by enemy tribesmen at about 1pm as they were attending the funeral of the three men from the same tribe who were gunned down last week. The tribe of the victims is Paipeli, on the outskirts of Tari town which has been at war with the Lineapini tribe since 2012. The Lineapini live about 15km away. They both belong to Tari-Pori district. Pokaje said: “It is not a real tribal fight. What we are seeing is hunting and killing. It has been going for a long time. Yesterday, Governor Andreson Agiru met provincial police commander Mark Yangen and commanders of the mobile military contingents posted to Hela. He called on them for support to quell the seven tribal fights raging in the province and to protect State assets such as the LNG Project and to provide security on infrastructure projects. The contingent commanders pledged their support.